The dress shirt is an item of clothing worn for many reasons, such as practicality, formal occasions, business attire, and merely the desire to look your best. Through the centuries, the dress shirt’s accepted designs and choice of fabrics have regularly changed rapidly with the dynamic nature of fashion and style. 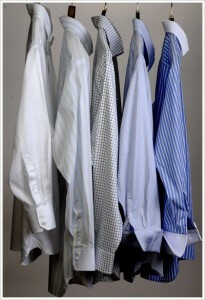 Dress shirts have their origin as undergarments worn under jackets and waistcoats in Europe. As early as 1300 shirts began to become popular and its popularity started to spread as they are featured in canvas paintings of the time. During the early years, the main function, however, was hygiene. Fine clothing would often be worn many times over without washing. Plain linen shirts were popular because they were easiest to wash. Shirts therefore, worn against the skin kept other clothes fresh and it wasn’t long until shirts became popular as a top layer or single layer for those wanting something functional and more elegant. Those of the middle class of early Renaissance Europe, wore shirts for jobs such as painting and serviceman. In rural areas they later began to replace smocks along with trousers. In around 1500, custom dress shirts, with fantastic designs became popular with the nobility. This trend most probably first started inItalyand spread throughoutEurope. Towns such asVenicebecame famous for their production of custom dress shirts and the materials they used. Dress shirts in the 16th century were quite different and contained a lot of fabric for fashionable designs. Fabrics used to create ruffles and frills, were often custom dress shirt designs made to the latest fashions or to set the latest fashions that were continually changing. It wasn’t until the 19th century that designs of shirts for different occasions started to be set in stone for any period of time. Dress shirts for formal occasions developed a distinct style first. Many more styles of shirts were developed as the industrial revolution moved forward. Although textile mills were able to produce off the peg shirts in large numbers; custom dress shirts remained popular among both the nobility and middle class. It was late in the 19th century that dress shirts became work wear, as people came off of the land and into factories. Dress shirts started to become increasingly popular for being practical and easy to fit. The term blue collar is originally from the 19th century as most workers wore blue dress shirts, which was often required by their employers. White collar is a term with origins in the 1930’s to describe office workers andclerical staff. Shirts have remained popular throughout the 20th century and became accepted wear for many jobs and positions. Casual dress shirts, in various patterns and checks with rugged materials were popularized by the American Western. 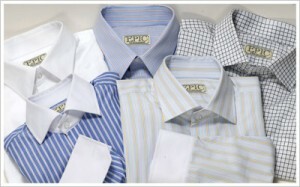 Dress shirt collars have developed alongside the development and popularity of neck wear. Cravats and bowties have been replaced, in most fashion circles by a necktie, particularly true in a work or formal environment. In the late 20th and early 21st Century fewer corporations require their employees to wear dress shirts and ties. However, many sectors of the business, legal, and financial world, the dress shirt remains as popular and fashionable as ever. The custom made dress shirt is becoming more popular for the Hard to Fit person that may have a thick neck or broad shoulders or the individual that is particular with the way they look at all times.